Essential to the development of the brain, the central nervous system and the retina, DHA is an omega-3 fatty acid that the human body cannot manufacture. For a developing infant, that means they must rely on their mother’s breast milk as a source. Omega-3 oils are incredibly beneficial for both mothers and infants. During your pregnancy, polyunsaturated fatty acids are incorporated into fetal brain and retinal lipids. Docosahexaenoic acid (DHA), in particular, is needed to support the development and function of the central nervous system. Unfortunately, most pregnant women cannot obtain sufficient quantities in their diet. A study conducted on pregnant Canadian women found that 90% of participants fell below the suggested amount as calculated by Dietary Reference Intake recommendations. Clinical trials revealed that higher intakes of DHA from fish or from supplementation resulted in infants with higher cognitive scores and higher IQ’s. Increased DHA intake has also been linked to better sleep patterns, improved birth weights, enhanced immunity, a reduced risk of allergic disease, as well as preterm delivery. 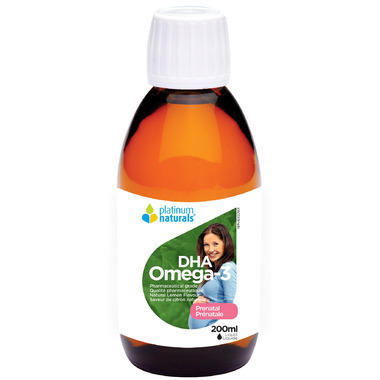 Prenatal Omega-3 DHA offers concentrated DHA as well as 1000 IU of vitamin D per serving to further protect the health of mother and child. * Products are manufactured without gluten but not tested. Recommended Adult Dosage: 1 teaspoon once daily after a meal. Non-Medicinal Ingredients: Rosemary extract, ascorbyl palmitate, natural tocopherols, natural lemon flavour. Important: Refrigerate after opening. Use within 3 months of opening.